In 1913 Seiko produced the first wristwatch made in Japan, the Laurel under the Seikosha label. To celebrate this milestone, Grand Seiko has launch a set of 100th Anniversary commemorative watches, these models are limited editions with 9S64 caliber (white, pink, yellow gold and stainless steel case) or 9S65 caliber (stainless steel cases only). The 9S64 caliber models are a return of Grand Seiko classic launched in 1967, the 44GS. It established a new look for the collection as it was the first Grand Seiko watch to embody and express the design ideas that a young designer had recently defined for the brand. He added to the purely functional goals of precision, practicality, comfort, excellence of the movement, also a brilliant and sparkling design, which he has studied in Wako a luxury store in Tokyo founded by Kintaro Hattori. The company states that he invented the “grammar of Seiko design” and the 44GS was the first watch designed to this new specification. In this historical collection, the 9S64 caliber models have a high accuracy 8 beat caliber (+5 to -3 seconds a day) with a 72 hour power reserve and featuring 24 jewels. The case diameter is 38 mm, which is rather small according to today’s design standards, all these models have a 3 bar pressure water resistance and manual winding type driving system. In addition, it was also launched two 9S65 caliber models (SBGR081, SBGR083), with 40 mm diameter stainless steel cases. Both models are identical excluding the dial color (in black or white color option). The 9S65 is also high accuracy 8 beat caliber (+5 to -3 seconds a day) with a 72 hour power reserve but with 35 jewels and automatic winding type with manual winding function, these models have a 10 bar pressure water resistance. 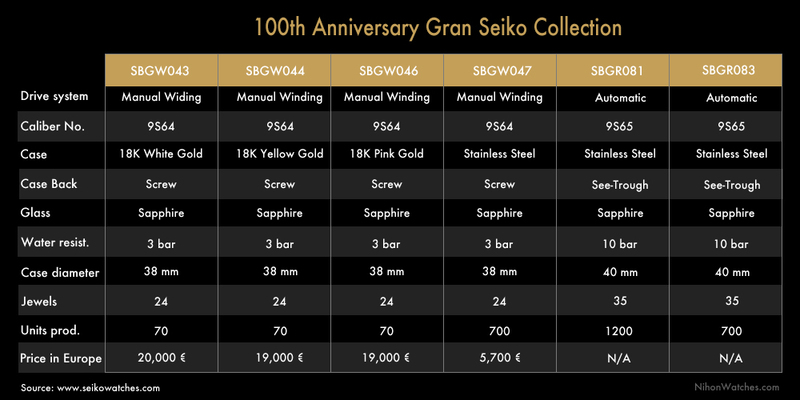 For specifications, units produced and prices regarding this Grand Seiko limited historical collection, please check the summary table below.